The Finn Kaija Saariaho is now in her 60’s and long established as one of our leading contemporary composers, well known for her four full-length operas, her 2006 oratorio La Passion de Simone, and numerous orchestral works and concertos. 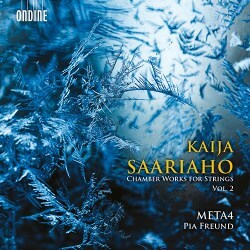 Ondine here releases the second instalment of Saariaho’s string chamber works with the Finnish string quartet Meta4, who formed in 2001. This disc, like the first volume from Meta4, offers a range of her smaller scale works, including songs with soprano Pia Freund, a regular Saariaho collaborator. Six of the eight tracks are between four and six minutes long. There are just two substantial items, …de la Terre for violin and electronics (1991), and Terra Memoria for string quartet, which is the most recent composition, premiered in 2007. Only that work and the opening piece Fleurs de Neige are actually for a conventional string quartet line-up, the others for a smaller combination, in three cases adding the soprano voice. Furthermore only Terra Memoria is in its original form, every other work on the disc being adapted from its original scoring and in some cases extracted from a larger work. Fortunately there is a very helpful and appreciative booklet note by Kimmo Korhonen that explains the origins of all these derivations. It cannot be denied that as a whole the disc has a slight feeling of re-treads and chips from the workshop. But it is the workshop of a great artist. So it is Terra Memoria, which was Saariaho’s first work for the medium of string quartet in twenty years, that is the main interest here, and it is the main reason – though not the only one - for hearing this disc. It was commissioned by Carnegie Hall and premiered by the Emerson Quartet, and the title refers of course to both earth and memory. The earth element is the thematic material of the work, and the memory aspect is the way that material is used. The piece also refers in a general sense to “those departed” but who live on in our memory, sometimes unchanging and sometimes developing in our thoughts. Thus some themes in the piece change in the course of it and others do not. This blend of the dynamic and the static takes a few hearings for the listener to grasp, but that is an absorbing and rewarding task, when the invention is so fertile. Saariaho makes use of a variety of exotic playing techniques, and there are some shape-shifting textures and musical mutations, such that the work’s form is rather elusive. If you are allergic to avant-garde writing this won’t be for you, but the adventurous or merely curious should not be put off – certainly not by the strangely dismissive Gramophone review it was given. Of the other works, de la Terre for violin and electronics is abstracted from a longer dance piece for Finnish National Opera, and also has a wide range of intriguing effects, both from the electronics and the solo violin, but perhaps needs to be seen on stage to make its full effect. Pia Freund sings the three songs eloquently, texts and English translations are provided in the booklet. Perhaps the most immediately attractive of these is the Hölderlin setting Die Aussicht (“The Perspective”). But alongside Terra Memoria, the work I shall return to most often I suspect will be the other work for string quartet proper Fleurs de Neige, another extract from a larger work (Neiges, 1998), and scored originally for a cello ensemble. In this quartet version its evanescent mood with fleeting trills and tremolos seems perfectly to evoke the snowflakes falling from a dark sky that apparently inspired it. Meta4 is an internationally successful group of players, and play superbly throughout – they are clearly able to evoke the desired musical effect from these myriad ways of writing for just a few string players. The sound is realistic but atmospheric, those subtle string effects perfectly balanced both by the players and the recording engineer, with the soprano voice convincingly placed in the acoustic. Saariaho collectors will have this disc already no doubt. If you are new to Saariaho this would probably not be the place to start – better to acquire Ondine’s budget 4 CD box (2012) of various works for orchestra written between 1986 and 2007. But every music lover should try to encounter in some form this important voice in contemporary music.